MPR: This is B-3 organ night! Listen to "Real Good'n" from "This is Organ Night"
Listen to "Take 5" from "This is Organ Night"
If it's Tuesday night at the Artists Quarter in St. Paul, It's "B-3 Organ Night." 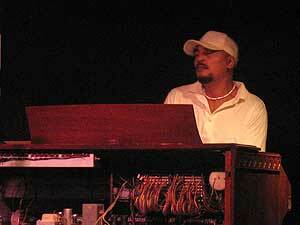 For the last nine years Billy Holloman has been exciting audiences with the rich, soulful growl of his Hammond B-3 organ. Now, Holloman is releasing a CD. It's called, "This is Organ Night." St. Paul, Minn. — For Billy Holloman, there's no greater thrill than unleashing the power of the Hammond B-3 organ. "I always compare it to the difference between riding a bicycle and riding a Harley," he says. "On a bicycle, basically there's not hardly any power at all, just more of a glide. But with the B-3, I can feel the power, and when I want to call up more power there's something there for me to reach for." You could say the B-3 organ is in Holloman's blood. Growing up in St. Paul, he heard it in church. Many of his relatives live in Philadelphia, where Holloman says B-3 organ jazz originated. He really became attached after listening to his brother-in-law, the great organ player Bobby Lyle, performing in clubs like the Blue Note in Minneapolis in the 60s. Back then every jazz club had a Hammond B-3. Holloman taught himself to play by sneaking into some of them during the afternoon, and practicing until the owner shooed him away. He often went to a bar called Road Buddies in St. Paul. One day, the owner took notice. "He said, 'the kid don't sound that bad.' And then he stopped telling me to get out," Holloman laughs. "Then one day he says, 'Hey man! I need some music, I got some people having dinner.' And then I came right down and that was actually my first job. And he didn't even give me money he just said get yourself something to eat. I said 'Yeah! All right!" Billy Holloman is 58 years old. He plays what he calls "old style" B-3 organ, in the tradition of such masters as Captain Jack McDuff, Jimmy Smith and Bobby Lyle. It's a thick, swirling, swinging blend of funk, gospel, R&B, and of course jazz. He's backed by veteran saxophonist Gary Berg, and drummer Kenny Horst, owner of the Artists Quarter. Horst used to play with Bobby Lyle. Back in the 60s, Lyle's group often performed in predominantly black clubs in the Twin Cities. In an effort to attract more African Americans to the Artists Quarter, Horst gave Holloman a regular Tuesday night gig. "I thought maybe we'd get that crowd on a Tuesday," Horst says. "We'd call it 'B-3 Organ Night.' And strangely enough, we got a few of them but it never quite happened. What happened is we ended up getting a college crowd. How that happened I'm not quite sure, but we'll take it." On B-3 Organ Night, the Artists Quarter fills with a decidedly younger crowd. 22-year-old jazz lover and University of Minnesota student Justin Crum of Minneapolis, likes to sit and be overpowered by the B-3. "It's such a wonderful full sound that can't be created elsewhere that has so much gut and soul to it that you really don't have anywhere else." 21-year-old Kara says she appreciates the $2 cover, and the dark smoky vibe of the Artists Quarter. "It's just a very urban feel, and it's pretty free flowing. And you can see it in him when he plays. I love that. It's amazing." Billy Holloman's new CD, "This is Organ Night," has been a long time coming. Kenny Horst says he's been begging Holloman to make it for years. It was recorded live in the Artists Quarter, and features the most requested tunes from Holloman's set. That includes one of the popular jazz songs ever written, Dave Brubeck's "Take Five." Holloman's rendition lets saxophonist Gary Berg establish Brubeck's familiar motif, and then the B-3 takes over. "That song more so than any one is just requested over and over again," Holloman says. "Some guy would come in sometimes and lay five dollars on the organ and wouldn't even bother to tell me. Cause I already knew he wanted to hear "Take Five." And sometimes I would just lean back over to him and say: 'Ah man! We already played it! You missed it!' You know, just to get out of not playing it." Holloman's new CD "This is Organ Night" has impressed City Pages writer and occasional jazz critic Britt Robson. Robson says the disc really captures the flavor of Hollman's Tuesday shows at the Artists Quarter. The Hammond B-3 has undergone a renaissance in recent years. Some say older generations have become nostalgic for it, while to younger people, it sounds new. Robson thinks the B-3 forms a bridge between the entertainment value of pop music and the serious stimulation of jazz. "The B-3 organ experience is a great middle ground because it's a very rhythmic, tonally resonant instrument, and when played well also can be as improvisational and as dense and cerebral as any other instrument, but does offer that bridge for people. And I think that's a great experience." While Billy Holloman is pleasantly mystified by the B-3's comeback and by its appeal among young twenty-somethings, he's hoping to ride the wave. In the meantime he's happy he's become a Tuesday night tradition at the Artists Quarter. "By playing on the B-3 every Tuesday, has made my playing ability come along. Cause you know for a while there I was just so much into drinking, that I would just show up at the gig and go on home, you know? So that steadiness and quit drinking has enabled me to focus back on music itself." In honor of Holloman's new CD, "This is Organ Night," tonight and tomorrow night will become organ nights at the Artists Quarter in St. Paul, with Billy Holloman on the B-3.